1 December 2013 - WHAT A MONTH IN NOVEMBER!!!! At the end of October, we had a very big wind storm come thru and it took the roof off the Elders' apartment. We have spent a great deal of our time since then, making arrangements for a new apartment for them - theirs was not habitable due to all the water leaking and damage to pretty much everything. We also worked with the Mission Home to ensure their old apartment was properly secured, and all the administrative handling to get them into a Hotel during the interim was accomplished. Everyone worked hard and the four of us felt pretty well used up. The Elders, however, worked double as they were putting together their new apartment, furniture, etc. at the same time we had not move out of their old one. Some of the brethren from the Branch were very helpful - especially Juergen Schulz who speaks very good English and what a difference it made for all of us. I hope my new antenna can get me in touch with Scotty. I need to beamed up. Elder Brindley on the street where he LIVED! A very interesting place indeed. The storm sure motivated us to get out and find a new place to live for them. It took some doing to get all this - PLUS - out on the street from teh 5th floor (YES - 5th). The City was coming by the next morning between 8am and 12-noon to trash it all into their big haul away truck. Some of this was aerialized out the back window and carried to the front vs. down all those stairs with so many loads. It was a site to see Sister Porter waving the OK for all clear to launch another piece of furniture on to the back lawn. covering and large bubbles formed. Ceiling at top, walls running down. Water is long gone, but it was a mess. go to the RESCUE quite literally in this case. Below is my Happy Birthday card from our grandkids. We also have weekly meetings in Oldenburg - sometimes District and sometimes Zone. On the road again - Lots of clouds and lack of sunlight for good pics - we hope to do better in Spring and Summer. Many farmers here get a better income from wind power generators than they do farming. These things are all over the place. Every time I see them I am reminded of ALIENS ARE HERE!!!! Everybody wants to get a picture that is timed to let all be in the picture. Elder Meeks is the one with the very nice hat on the left - he works with Elder Brindley in WHV. 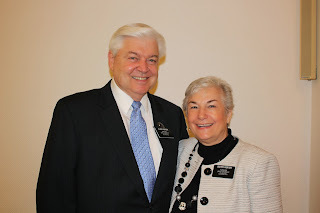 Elder Wolfgang Paul and his wife. They are in charge of the Institute and YSA (JAE) program. They live hear Oldenburg and are at our meetings. Their home town, however, is Frankfurt. He was released as a 70 recently and we feel very lucky to have him and his good wife in our midst. They were in Russia for a few years to get the work going there. It was not easy and they are happy to be working with all of us now. He does think it's a long way from California, however. Nevertheless - the work goes forward. 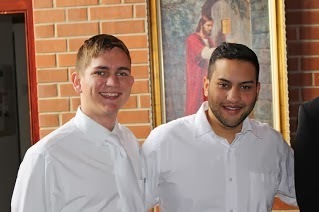 Elders Brindley and Meeks had a baptism in November - also at Oldenburg as our building doesn't have a baptismal font. 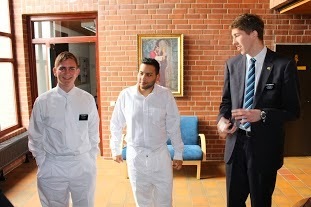 From left to right - Elder Meeks (California), Brother Nelson Jahnel (Taufling) and Elder Brindley (Utah). Br Jahnel plays semi-pro table tennis, coaches the game, and goes to school. He is 25, born in Germany, but his mother is from Thailand. Both parents are dead and Nelson only has a grandmother left. He jumped on Genealogy (Now Family Research? Familienvorschung) when we introduced him to it at our FHE at our home a couple of weeks ago. He also wants to do the lesson for our FHE this coming week. It was very nice to see his excitement of discovery and his enthusiasm pick up as he begins to get to know the gospel potential and the members of the branch. 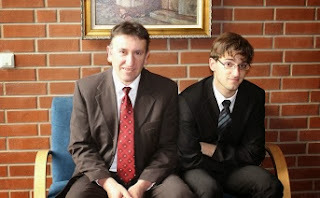 Left ot right, Brother Crnoglavac (don't worry, it takes practice) and his son David who is 21. Did someone say YSA/JAE? Elder Meeks baptised Brother Jahnel. Elder Brindley confirmed him at Sacrament meeting the following week. We were happy to be part of it . AND - we are happy to be here. (I know most of you have no idea who Mr. Murrow was, but you may find him interesting by seeing if Wikipedia has a write-up about him). I used to listen to him on the radio whne I was MUCH younger.